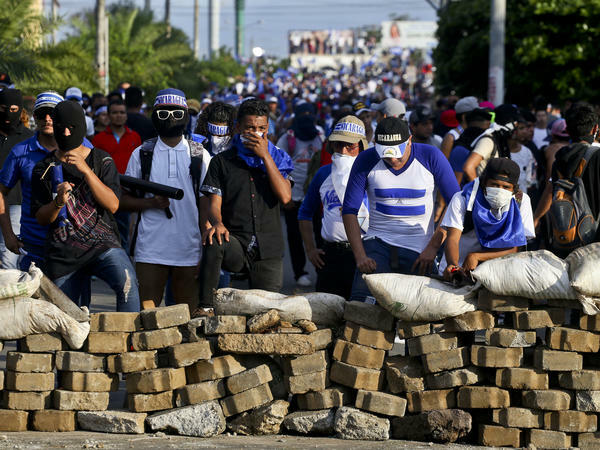 Demonstrators take cover behind a barricade during their march Wednesday in Managua against Nicaraguan President Daniel Ortega. 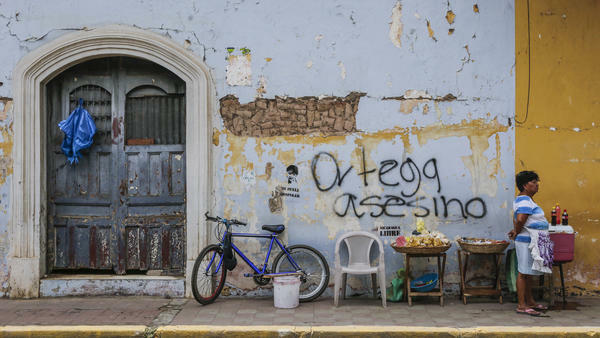 A woman sells refreshments in front of graffiti that reads "Ortega murderer!" in Granada, Nicaragua, last week. The city's tourism industry has grown anemic since the wave of protests broke out in April. President Daniel Ortega speaks at the opening of a national dialogue in Managua earlier this month. The conference, in which Ortega sat down for formal talks with opposition and civic groups, did little to slow the bloodshed still unfolding. A demonstrator stares down the camera after setting up a barricade in Leon last week. By the time clashes between security forces and protesters had ebbed, human rights activists said they had received reports of demonstrators dead and seriously injured. 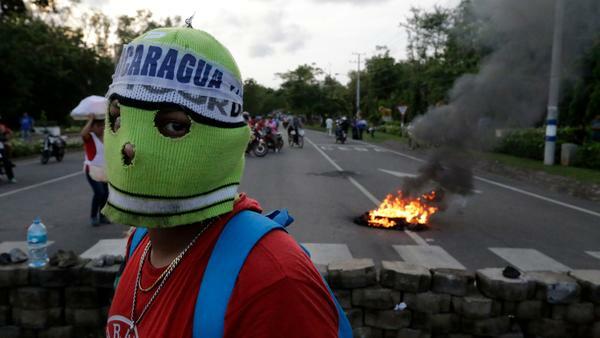 The Nicaraguan Center for Human Rights announced that at least 11 people were killed and 79 injured in the single day of violence. The death toll represents but a fraction of the more than 80 people who have died in the six weeks since Ortega attempted controversial reforms of the country's pension system, according to a report released Monday by Amnesty International. Just days after publishing them, Ortega withdrew those reforms — which had upped workers' contributions while slashing benefits — but it was too late. By then, NPR's Carrie Kahn reported "the genie [was] out of the bottle." "People have ... more grievances with the government than just the problems with the pension system," she explained last month on All Things Considered, not long after Ortega tried to walk back the move. At that point, two dozen people had already died in the protests. "Now people are very upset about the high murder toll, the repression by the police, their response to the protesters. And it's just sort of uncapped all the grievances that people have had about this government." In the weeks since the protests took root in at least a half-dozen cities, the demonstrators' demands have escalated — from initial resistance to the reforms alone to some calls for Ortega's immediate ouster — as Ortega's security forces and supporters have responded with violent force. "The Nicaraguan authorities have turned on their own people in a vicious, sustained and frequently lethal assault on their rights to life, freedom of expression and peaceful assembly," Erika Guevara-Rosas, the group's Americas director, said in a statement. "The government of President Ortega has then shamelessly tried to cover up these atrocities, violating the victims' rights to truth, justice and reparation." Amnesty International says security forces have partnered with what it calls "Sandinista mobs," after Ortega's political party — armed groups of Ortega supporters attacking protesters with the tacit approval of the police and military. Perhaps no single incident captured national attention more — or galvanized more popular anger — than the killing of journalist Ángel Gahona on Facebook Live. Gahona had been broadcasting video of protests in the city of Bluefields on April 21 when he was shot dead in the middle of his live-stream. But as the Committee to Protect Journalists notes, violence against members of the media has not been confined simply to one side of the standoff. The international organization reports that a "mob armed with Molotov cocktails and homemade mortars" launched an assault on a pro-government radio station and set fire to the building earlier this week. "Nicaraguans deserve access to diverse news sources," said the committee's program director, Carlos Martinez de la Serna, "and all parties should respect the right of journalists to work freely and safely, regardless of political affiliation." The Organization of American States has stepped in since then, organizing a visit to the country and publishing a preliminary report detailing the alleged abuses of Ortega's government. The list is long, according to the organization's independent human rights commission. There have been "dozens of persons killed and hundreds wounded," Inter-American Commission on Human Rights, or IACHR, said last week, "illegal and arbitrary detentions; practices of torture, cruel, inhuman and degrading treatment; censorship and attacks on the press; and other forms of intimidation such as threats, harassment and persecution, all aimed at dissolving the protests and inhibiting citizen participation." On Wednesday the IACHR and its parent group, the OAS, announced that they would be launching an independent investigation into Ortega's response to the protests. Members of the European Parliament lent their voices to the international criticism of Ortega on Thursday, voting overwhelmingly to condemn "the decline of democracy and the rule of law in Nicaragua." European lawmakers also demanded significant "electoral reform that results in fair, transparent and credible elections that respect international standards." 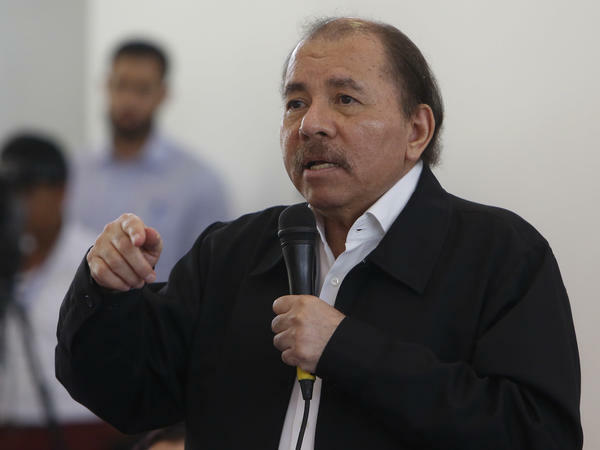 Reuters reports that Ortega, who won re-election again last year after about a decade in power, is not scheduled to face re-election again until 2021. Meanwhile, the country's conference of Episcopal bishops on Thursday cut off planned talks with Ortega, citing the violence on Nicaragua's Mother's Day. "We want to make it clear that the national dialogue can not resume," the bishops wrote, "while the people of Nicaragua continue to be denied the right to demonstrate freely and continue to be repressed and murdered."